That other enormous textile mill in Germantown will soon be transformed into 150 loft-style apartments thanks to a partnership of the Marian Development Group, lawyer Ashley Blacketer, and investor Chad Middendorf. Just a few blocks from Underhill Associates’ extensive transformation of the Germantown Mill Lofts, the historic Bradford Textile Mill will include “true Class A amenities” such as a pool, a full gym, and community rooms, Justin Brown, partner at the Marian Development Group, told Broken Sidewalk. Located at 1034 East Oak Street at Reutlinger Avenue, the Bradford Mills–Boyd Moving properties comprise two buildings connected by a bridge. Brown said the older brick building on the corner featuring a dominating Mission/Spanish Revival stair tower was built in at the turn of the century and lends itself to one-bedroom units while a concrete addition dating to 1924 lays out perfectly for two-bedroom units. “Our background is in historic renovation,” Brown said. “We have had a lot of experience using historic tax credits for adaptive reuse.” The Bradford Mill complex was listed on the National Register of Historic Places in 1982, which will aid in that tax credit process. 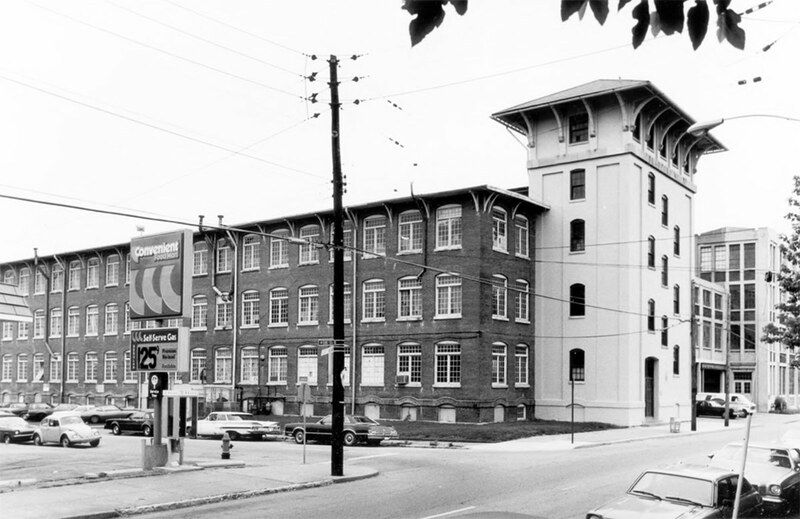 Historically, the mill was part of the Boston-based American Woolen Company. 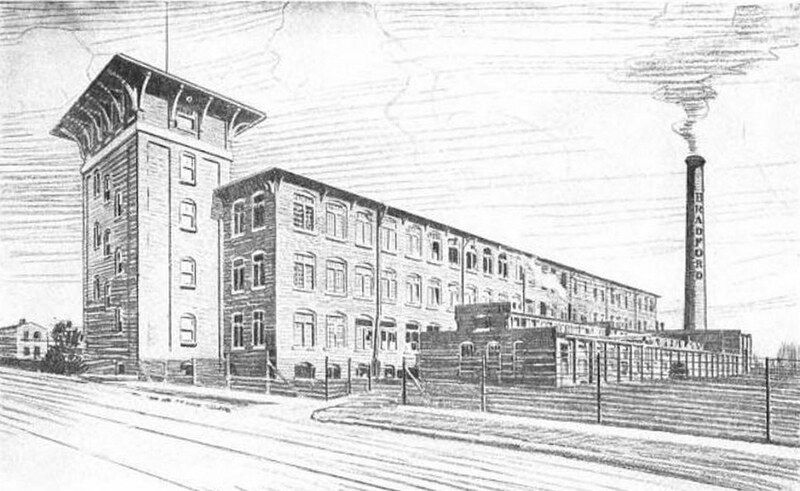 According to a 1922 issue of the American Wool & Cotton Reporter, the mill produced “worsted weaving yarns” A book put out in 1921 by the parent company describing its extensive assets across the country noted that Louisville had many such textile mills at the time, with the Bradford facility including an equipment roster of “5 cards, 5 worsted combs, 7760 worsted spindles, 3640 twister spindles, 3 boilers” before its later expansion. One interesting historical feature of the building is a small stone engraving embedded into the older building’s tower. 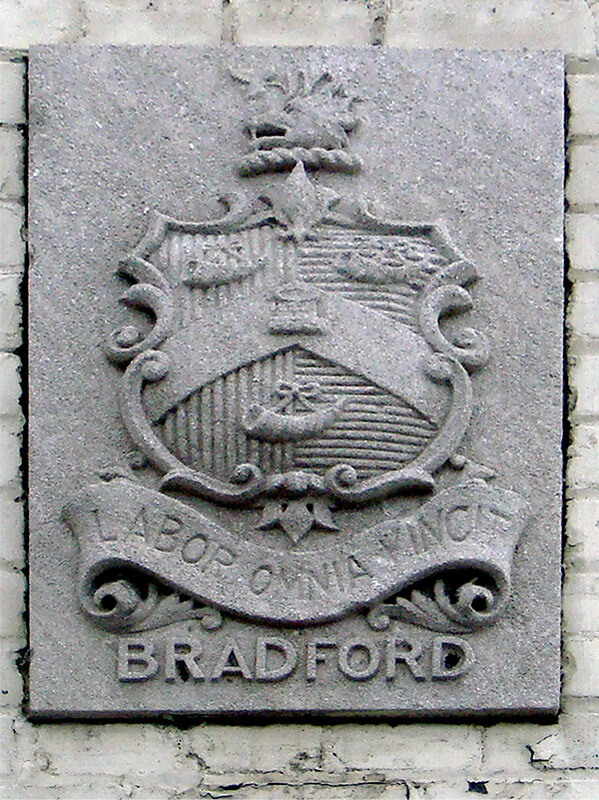 The stone includes an ornate crest with the Latin words, “Labor omnia vincit,” inscribed below it in a ribbon, with the name Bradford below that. Those words translate to “Work conquers all,” an adaptation from an ancient Virgil poem supporting Augustus Caesar’s program to employ Romans as farmers. The slogan has come to be adopted by cities, universities, and a number of labor groups, indicating that the mill may have been unionized. Mitchell Kersting and Tyler Watkins of WorK Architecture + Design are handling the design of the adaptive reuse into “modern, cool, lofty interiors” as Brown described it. He said historic details like color variations on the buildings old wood floors showing where machines once sat and where carts rolled through will be kept in place to showcase the building’s heritage and add character to each unit. Kersting has previously shown his interest for and care of historic buildings by renovating a corner building on Portland’s Boone Square Park into his company’s offices. The new complex won’t be shut off from the community, Brown explained. “We’re going to have great amenities, but what we’re not trying to do is fence up the property and parachute in new residents,” Brown said. “We want to be part of the community.” Design gestures are intended to bring the community into the complex, including a 2,500 square foot restaurant or cafe space located between the two buildings. Brown said his team also plans to improve a nearby TARC bus stop, which is currently “just a pole in the ground.” “We don’t want to have our own dog park,” he added. “We want our residents to walk their dogs in the neighborhood.” Developers are also in talks with Metro Louisville to potentially bring a bikeshare station to the property, which would extend the initial bikeshare zone farther east than was previously planned. Brown said the Bradford project came together a year and a half ago after a chance encounter with Blacketer and Middendorf, who had the properties under contract. Marian helped put together the development plan. Blacketer previously rehabbed a drab apartment building on Frankfort Avenue into the Flats on Frankfort. We previously covered Marian‘s work with a series of townhouses called the Phoenix Lofts and their work with the Family Scholar House. At the Bradford, the team plans to completely restore the complex’s historic facades. Inside units will feature luxury materials like granite countertops and top appliances. Brown said the shortest ceiling height is 14 feet, with some top-floor apartments featuring 28-foot ceilings—he said those units also feature spectacular skyline views since the complex sits on top of a hill. Bedroom walls are three-quarter height and feature glass sliding doors to maximize natural daylighting. Broken Sidewalk toured the older of the two Bradford Mills buildings back in 2009, and we got to see the enormous interior spaces first hand—and the building does feel monumental. Thick brick walls and large windows are everywhere. Diagonal wood flooring does, as Brown indicated, have a time-worn patina. The German-Paristown Neighborhood Association (GPNA) recently weighed in on the project after hearing from the development team last Monday, supporting the project. Steve Magre, the area’s Metro Councilperson and a local resident, told Broken Sidewalk that he likes what was presented to him: “This is not dissimilar to the commitment that the Underhills are making nearby,” he said. “This is about protecting the history of those two buildings and their significance to Germantown. Magre also noted that developers and the neighborhood are discussing converting Oak Street in the area to two-way traffic, at least between Swan Street and Reutlinger Avenue, to assist with access to the building. “This is not a new idea,” Magre said. The project must still move through an official development process with Metro Louisville to garner appropriate approvals, but developers hope to begin pre-leasing the apartments in spring 2016. Together with the Germantown Mill Lofts’ 187 units, the Bradford’s 150 units are quickly transforming Germantown from a predominantly single-family shotgun house neighborhood into a mix of living options and one of Louisville’s leading urban neighborhoods. It’s certainly going to be exciting to see how the neighborhood evolves over the next few years. This should be cool. Nice to hear someone has vision for once. This is great to see. 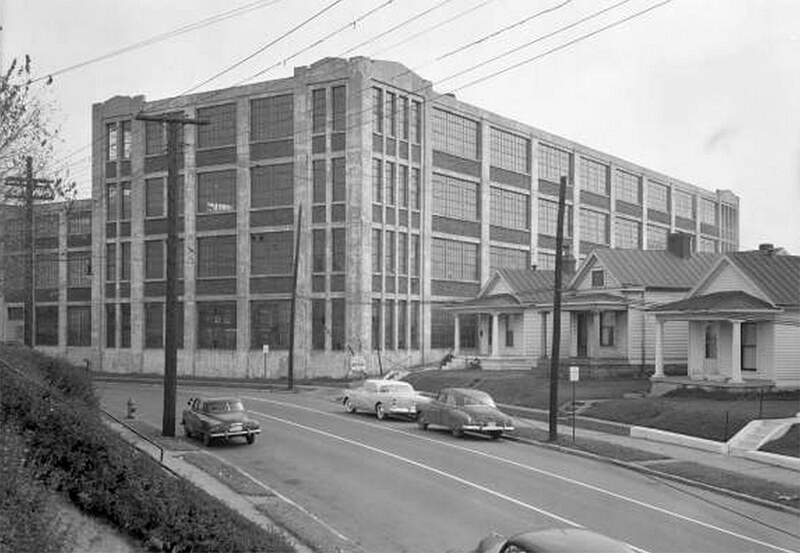 I worked in that building when it housed a book repository back in the mid 60s when I was an undergrad at UL. Great bones, as I recall. Awesome. Now for the warehouse lining Kentucky (housing The Root Cellar at the east end). And the tall one on Logan (?) with the tree growing from the roof. (I think that one was proposed pre-recession.) This could get really interesting. Fingers crossed. Oak & St. Catherine/Mary could both easily become two-way all the way through Old Louisville (& the west end for Oak) simply by putting a small one lane roundabout at the point Oak & Mary meet two short blocks east of this project. I can hardly wait for this to be developed. It’sgoing to great for Germantown.